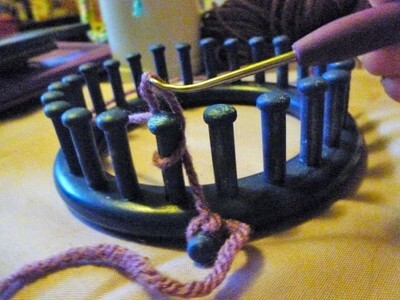 A method of arranging and connecting mediums such as threads and yarns to form fabric, which can be shaped and formed into objects. This is completed on a loom, which is often made of wood, plastic, or even metal. A loom consists of a base with pegs placed at intervals. The pegs may be fixed or removable. There may be an anchor peg, which is affixed to the side of the base. 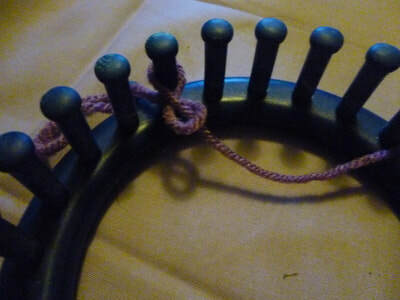 A slip knot is placed on the anchor peg to begin the project. If there is no anchor peg, the slip knot is placed on peg 1 of the loom unless otherwise noted. On a round loom the stitches are done all around, then the next round is begun on peg 1. Do not turn. You can also turn at the last peg before the anchor and make a flat piece. This makes rows. The base of most projects consists of row or round 1. This is usually a series of wrapping the pegs, wrapping them again, and then lifting the bottom loop off the peg over the top loop. The top loop is part of the next row or round. 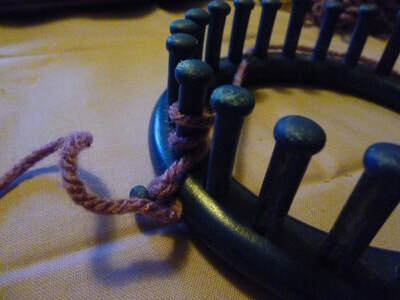 There are a couple of ways to wrap the pegs, which result in different designs on the bottom row or round. One basic way is to make an e-wrap. From the inside of the loom, bring the medium (working yarn, abbreviated WY) up from the anchor, cross the inside, wrap around the back of the same peg, bring the WY across the front again to the back of the next peg, repeat for the number of stitches you want. Wrap the next row or round and lift the bottom stitches off to create your first row or round. 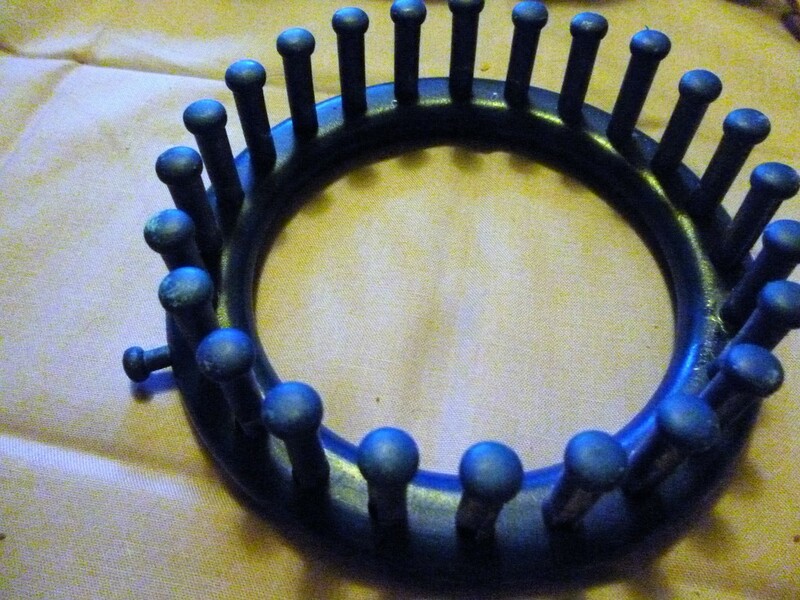 · Start with a long enough tail on your anchor slipknot? · Make your e-wraps even, not too loose or too tight? · Smooth your stitches as you work? The e-wrap creates a twisted knit stitch, comprised of two legs and a post. The height and width of the legs are determined by the size of the pegs. This will help set your gauge, how many stitches and rows equal an inch. This is important for your pattern. How to do the U-wrap stitch. Wrap as many pegs as needed for your pattern as though you plan to e-wrap. Lay your working yarn above the wraps. Lift your bottom loops over the working yarn and settle inside the pegs. The crochet cast on create a bottom very similar to real crochet. It can be cute on hats and scarves. 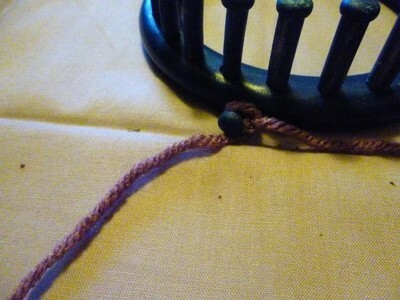 Make your anchor slip stitch, with a long tail. Wrap your peg 1 (with an e-wrap) and bring your yarn back below the wrap. 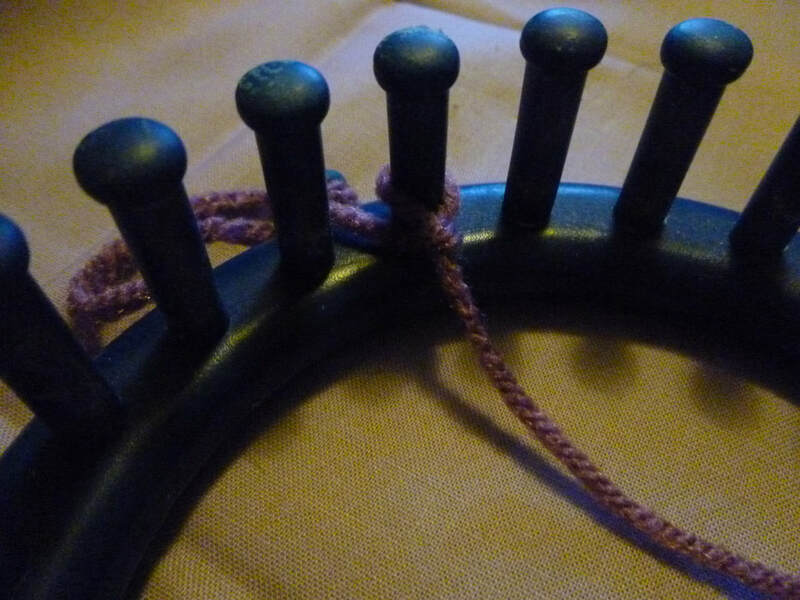 Use your hook to reach down into the wrap and pull up the working yarn below through. Place the new loop onto peg 2. Lay your working yarn below the loop on peg 2 and repeat step 3 to place new loop on peg 3. So what's the difference between u-wrap and crochet cast ons? The bottom of your piece is shaped by the cast on. 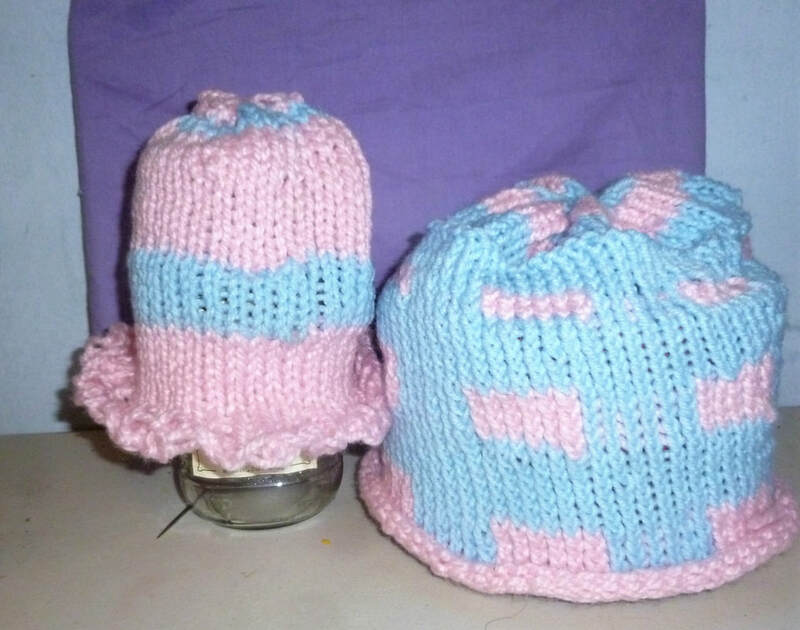 Below is a picture of 2 hats. On the left is a hat with a crochet cast on. To the right is a hat with U-wrap.